You may want to visit Thorpe Park with your family. Our team of bargain hunters has gathered and tested the latest cheap Thorpe Park deals so you can be assured that any voucher code is up-to-date. We also have selected the best and latest Thorpe Park special offers and deals from the most trusted retailers such as Attractiontix and Coca-Cola. Whether you are looking for any kind of item or vacation packages, there are a variety of choices await you from reputable sellers. Take advantage of the abundance of information that our community of bargain hunters will share with you. Clever Trick! Free 2-for-1 Entry to Alton Towers and Thorpe Park with Pepperami! Thorpe Park - 2 Day Ticket + Hotel Stay - Only £39.50! 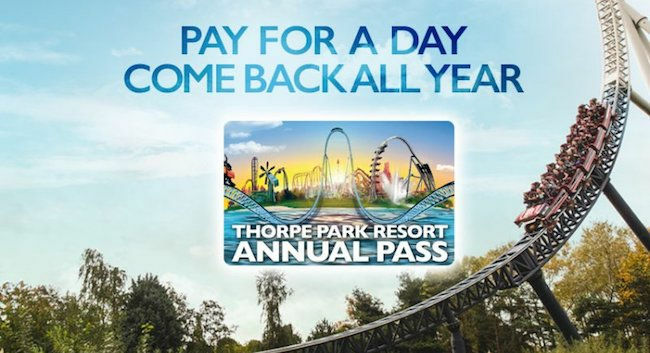 Thorpe Park Annual Pass Only £49!!!! Thorpe Park Early Booking - save up to 30% including school hols! Get the best Thorpe Park deals on tickets and hotels! Thorpe Park UK is a theme park that has a water-based theme which allows guests to view the park as an Island. Thorpe Park location is between Chertsey and Surrey. The Thorpe Park was opened to the public in 1979 and has grown as one of the major theme parks in UK. Thorpe Park Shark Hotel was also opened in 2014 so guests can stay overnight. THORPE PARK Resort is an Island Like No Other home to many rides including The SWARM, Stealth, Colossus and more. This history video looks back from when the park first opened in 1979, right up to 2017. Stealth. Dominating the skyline at Thorpe Park with its 205-foot tower, Stealth is the fastest roller coaster in the UK. Originally, it launched riders up to a top speed of 80 miles per hour in 2.3 seconds. Subsequent modifications, however, have reduced this time to just 1.9 seconds. The Swarm. Thorpe Park's major new addition for 2012 was The Swarm, the first Bolliger & Mabillard Wing Rider roller coaster in the UK. Riders are seated in pods of two on either side of the track, enabling the ride to incorporate a number of “near-miss” elements with the surrounding scenery. In 2013, the park reversed the seats on the final two rows of each train, enabling guests to experience the ride backwards. Saw - The Ride. Themed around the Saw horror movie franchise, Saw - The Ride is marketed as the "world's scariest coaster". The backstory sees evil genius Jigsaw challenging guests to prove that they are worth of living by braving his latest creation – the coaster itself. The ride features both indoor and outdoor sections, with a number of gruesome theming elements featured throughout. Nemesis Inferno. Nemesis has proven to be the star attraction at Alton Tower since its debut in 1994. Nemesis Inferno was opened in 2003 at a "sequel" of sorts to the ride at its sister park, although it boasts a completely different layout and a slightly different backstory. The alien from the original ride is said to have created the "volcano" setting for Thorpe Park’s version, though most guests will be hard-pressed to notice. Tidal Wave. Towering some 85 feet over Thorpe Park, Tidal Wave was the tallest water ride in Europe when it opened in 2000. A classic “Shoot the Chute” ride, it sees guests boarding reinforced boats, which use lap bars to hold them in place. The boat then climbs to the top of the tower, before plunging down into a lagoon below that holds 3 million gallons of water. Save big by using the latest Thorpe Park UK discount codes here at Latest Deals! Thorpe Park London is has now a total of 29 rides including 7 roller coasters, and 5 water rides. If you are looking for cheap Thorpe Park tickets last minute offers, Fright Night discount tickets, or Thorpe Park Shark hotel deals, you’ve come to the right place! You can find all the best and the latest Thorpe Park group tickets UK price drops here at Latest Deals. From cheap Thorpe Park fast track tickets to Thorpe Park tickets 2 for 1, you will surely find the cheap Thorpe Park group tickets and Thorpe Park fast track tickets you can buy online. We have a community of bargain hunters who are always looking out for the best possible cheap Thorpe Park tickets for sale across the UK that will provide with some serious money off on your purchases. While our team of money-saving experts are regularly sharing essential tips and tricks to help you save on your instore and online shopping. Most UK retailers regularly have sale events where you can save as much as 60% off on Thorpe Park UK They also have seasonal tour sales during Black Friday and Boxing Day. However, you can maximise your savings and get additional discounts by using the latest Thorpe Park discount codes here. There are even voucher codes where you can reserve and book a ticket with freebies. The promos and offers we have here are available for a limited time only, so grab them right away before they expire. Do not forget to bookmark this page and never miss out on fantastic savings and everyday low prices from your favourite UK retailers.